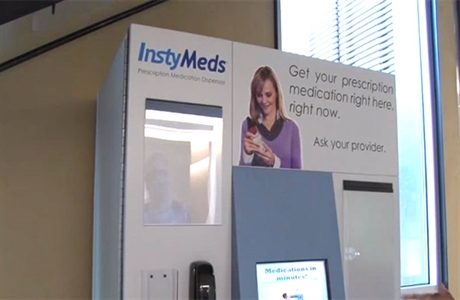 (NaturalNews) The total insanity of over-medication in America has reached a new low as Arizona State University has installed a prescription drug vending machine called InstyMeds. American college students — who are already the most over-medicated population on the planet — now have an even easier way to pollute their brains with SSRI drugs, antidepressants, antipsychotics and prescription “speed” amphetamines which are routinely abused by students for final exam cram study sessions. “You know, the things that you’d like to have right now to feel better,” said InstyMeds Vice President Bob Bang, according to CBS News. No doubt if cocaine were somehow patented by Glaxo Smith Kline, there would also be cocaine vending machines on college campuses by now, too, and marketed as a “performance booster” for students. I don’t assign any particular blame to the InstyMeds machine company, by the way. The machine looks like a competent invention to bypass the usual inefficiencies found in most pharmacy operations. The real problem with medications in America is found across the culture, in the quack science corruption and criminality of the drug industry, the “give me a pill, doc!” patient mindset, and the “quick fix” mentality where people think they can pop a pill to solve a problem. Check out the Instymeds website for information on their invention, which technically could be used to dispense all sorts of things that are far more useful for student health — such as vitamin D! Why don’t universities install nutritional products vending machines to actually support cognitive function and immune function among students? Big Pharma has already infiltrated and dominated medical schools and “science” journals. Drug company interests also completely dominate the mainstream media and government health care decision makers. Now they’re going to get their hooks into college campuses all across the country where students can be trained to believe that life isn’t complete without a prescription medication in their hands. Arizona State University is the second university in America to install the prescription drug vending machine, and many more are in the works. Seriously, is “easier access to more meds” really the answer to student health? “Serving the health-care needs of our students is still our highest priority,” remarked Allan Markus, director of ASU Health Services, when the campus closed its pharmacy. And yet, I’m willing to bet nobody at ASU Health Services ever bothered to tell students why they need to boost their intake of vitamin D.
In fact, if a vitamin vending machine were installed on campus, it would no doubt generate outrage and complaints from all the drug company reps and the doctors they routinely bribe to keep pushing their poisons onto students, pregnant women, babies and the elderly.